Summary: Shows the kind of promise that could have made it one of the best science fiction films ever made. 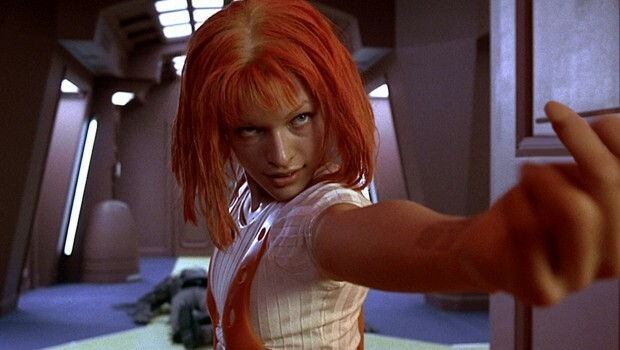 French director Luc Besson’s The Fifth Element is a film best described by the vernacular of football punditry, for it truly is ‘a game of two halves’. The first is full of glorious spectacle, a fantastic and fantastical coming together of state-of-the-art (at least for 1997) special effects, comic-book inspired imagery of the world in the 23rd century, and Besson’s whimsical, overactive imagination. The second is an appalling, camp mess, featuring grating performances of the highest-order, a disappointing reliance on big explosions and lame-brain action, and the fizzling out of a narrative arc which had more than a promising beginning. The film begins in an Egyptian tomb in 1914, where an archaeologist, accompanied by Luke Perry in perhaps his most pointless film role ever (and he’s had a few), is on the brink of discovering the mystery behind the ‘Fifth Element’, a supreme being that comes to Earth every 5,000 years and, combined with the plain old four elements, defeats whatever evil is threatening the planet. In this first half of the film, Besson has everything going for him. His main leads are top-notch: Jovovich is really rather good as the wholly-innocent and kookily amusing Leeloo; Willis does his usual wearily-laconic-cab-driver-who-used-to-be-a-top-soldier shtick; and Oldman camps-it-up displaying yet another of his distinct Yank accents, the sort of voice he could have easily used as Mason Verger in Hannibal had he not plumped for Jimmy-Stewart-on-acid. Besson’s storyline is vaguely intriguing, and there is that swell car-chase sequence to keep things ticking along nicely. What really works though, is the way the film imagines the 23rd century. Besson called upon a vast pool of talent when it came to the look of the film. Not only did he employ the services of James Cameron’s special effects company Digital Domain, but he also got Jean-Paul Gaultier to design the film’s costumes, and most importantly, he worked with legendary French comic-book artists Moebius and Jean-Claude Mézieres. These various influences, gelled together by Besson’s fertile imagination, led to an altogether different imagining of the future than had previously been seen in movies such as Blade Runner. In The Fifth Element, the world is bright, brash and breezy, a riot of camp colour, where Chinese restaurants pootle along in the sky , cigarettes are in reverse (long brown bit, short white bit) and New York city stretches mile up into the sky. It’s fun spotting what inspired the film, and what the film has now inspired, but most of all its just a great visual spectacle that happily doesn’t take itself too seriously. This impressive sense of style is what makes The Fifth Element, but it is also nearly the film’s undoing. For it’s a fine line between a movie being bright, brash and camp, and being loud, obnoxious and hollow. And this is exactly what The Fifth Element becomes. Things start going wrong when Korben and Leeloo head off to the fantasy planet of Fhloston Paradise, in order to hook up with some alien who’s been keeping the normal four elements safe and sound. For it is here that Besson introduces one of the most annoying characters ever committed to the celluloid: Chris Tucker’s DJ Ruby Rhod. It’s rather unoriginal to pan Tucker’s performance, but in truth he really he is bloody awful. Tucker has refered to his character as a cross between ‘Michael Jackson and Prince’, but in fact he’s more like a bisexual male American version of Jade from Big Brother who’s just had a gallon of Sunny D. He truly is the cinematic equivalent of nails down the blackboard. Not only is Tucker now present all the time, but the action relocates from the fantastic New York setting to a far more pedestrian hotel one. Besson gives up on any narrative satisfaction, relying instead on a bit of hokey martial arts, some big explosions, and a frankly ridiculous opera-singing alien diva who looks like a reject from the Mos Eisley cantina bar. The conclusion to the story (when Korben professes his love for Leeloo as she combines with the four elements to defeat a big ol’ ornery planet of evil), feels very rushed, and it all ends with a scene taken straight from any Bond film you care to mention. The Fifth Element shows the kind of promise that could have made it one of the best science fiction films ever made, a negative of the dark and dirty Blade Runner. Instead, it nearly ends up in the video bargain bin with Judge Dredd and Tank Girl. Nearly, but not quiet, and the first half of the film ensures that it is a good addition to any DVD collection. There is a fairly handsome set of extras for the Fifth Element fan. The menu on the first disc is quite fun, as Korben’s yellow taxi dodges oncoming traffic through the 23rd century New York skyline. Tech-heads will be chuffed with the interesting and informative audio commentary from some of the bods at Digital Domain, although it would have been cool to have secured a Besson, Willis and Jovovich commentary as well. Clearly some people were too busy entertaining Yank troops and making dodgy hair commercials. The highlight on the second disc is a meaty documentary on the making of the film from inception to production, and features a lot of input from the key players. The most interesting and charming of whom are not the squinting Willis or inarticulate Jovovich, not even the hyped up Besson, but the two French artists Moebius and Jean-Claude Mézieres. Looking at the work they created in preparation for the film, it is clear that without their input, The Fifth Element would not have been half asvisually interesting as it is. The other extras are basically extensions of what is featured in the main documentary, so you get more of Moebius being Gallic and charming, more of Gaultier being Gallic and camp, and more of the laughable alien diva (which is a bit of a mistake because the more you look at it the more ridiculous it looks). The most amusing extra on the DVD is MTV’s broadcast of The Fifth Element’s opening night in Cannes, as it shows just how long ago 1997 was in terms of culture – at the party for the film, entertainment is provided by, er, Neneh Cherry. Although this means that half the broadcast is taken up with Neneh singing her rather dull songs, it does bring into perspective the impact The Fifth Element must have made when it was first released. Even to an audience used to the effects wizardry of LOTR and Star Wars, The Fifth Element still looks innovative, so in front of a cinema screen in 1997, it must have looked pretty amazing indeed.